The Rocket Egg is the radical cousin of the Speed Egg. When RY - who inspired our Speed Egg - was introduced to the Kingfisher he said, "This board is so fast you'll have to register this design with NASA!" The Rocket Egg has more curve in the outline than the Speed Egg, the nose and tail are pulled in a little, and a little more rocker throughout. Design options are 2 x 1, thruster, quad, or convertible. The bottom contours on 2 x 1 version are tri plane entry and wide point to spiral vee with shallow concave in the vee panels through the tail. 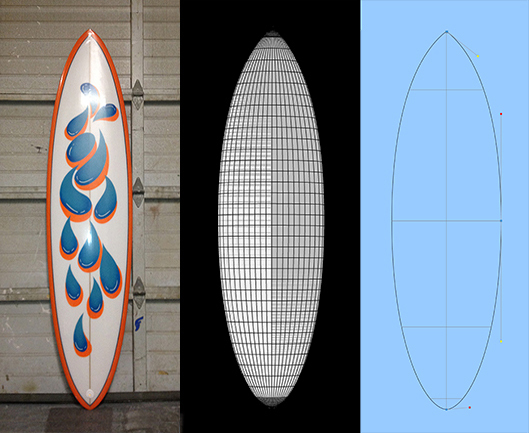 The thruster, quad, and convertible versions feature tri plane entry, single concave at the wide point, to double concave through the fin arrays and tail. This is another incredibly easy to ride, versatile, and rewarding design. It excels in beach, reef, and point breaks in marginal to perfect conditions and performs for surfers from novice to expert. The Rocket Egg is a perfect fit in every surfers' quiver and a joy to ride!